Tomb Raider is a storming reimagination of the series complete with all the jumping, shooting and mini puzzles you could care to shake a stick at. But it's also dark, gory and occasionally borders on the disturbing too - which makes for a gruesome yet delightfully gritty title that delivers with more impact than other games of its kind. 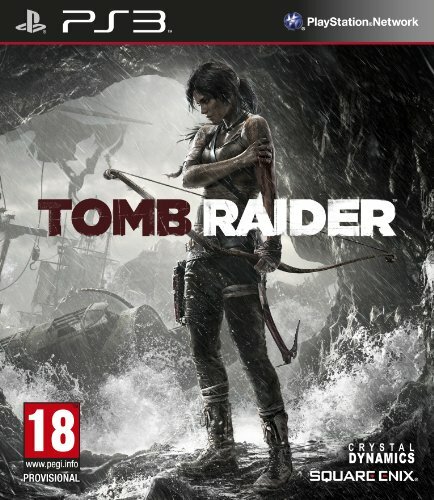 Uncharted fans should buy this on sight; Tomb Raider's not only as good, it's better. Tomb Raider has, by the very premise of its name, always roused the excited kid in us. And we don't mean because of the game's female protagonist, Lara Croft. Well, not entirely. No, there's something very Indiana Jones about adventure, treasure hunting and, er, booby traps. But Tomb Raider in 2013 is so much more than that: it takes the core action-adventure gameplay that fans will love but slathers it with all manner of dark and messed-up moments throughout its evolving storyline. It's this dark and gritty, movie-esque lick of paint that makes it so refreshing from the very start. You could say that the latest title turns the franchise on its head. Quite literally, as that's where we begin: upended, tied and bound following a boat crash on a mysterious island where unknown occupants have taken our heroine captive. Thus the tone is set, and it's a darker shade than most. Within the opening scene Croft's been impaled on a spike following her fist-to-the-face capture. It's not the pristine, white-wash game of years before. Speaking of wash, the Persil's well and truly out of the window too - Croft's seemingly taken a leaf out of John McClane's book; her blood and dirt-smattered vest top sure doesn't get any cleaner throughout the game. It's this kind of realism that engages from the word go, and there's no slowing down. Tomb Raider's riddled with just as many gunfights and explosions as a Die Hard movie too, which is a blast to play through, yet the game never loses sight of its puzzle and exploratory nature. Think Uncharted 3, then think even bigger and bolder - that's what Tomb Raider's all about. It's off to a flying start. Or not. First the boat, later a plane crash. It's all very much like the Lost TV show, only Tomb Raider's ducks and dives around its plot are genuine - the title knows where its headed from the very start. We're not going to spoil the adventure for you as that's all part of the fun of play, but let's just say that there are stacks of bizarre events, plenty of weirdos and a few surprises along the way. That's not to say that the classics don't make an appearance too. What would Tomb Raider be without the humble wolf? Croft's furry foe makes a marked appearance in the early stages of the game, and quite frightful these beasts are too. Penned by Rhianna Pratchett - daughter of the Terry - the plot sure is unflinching. Stepping into Lara's boots, complete with tally-ho British accent, is the voice of Camilla Luddington, best known from Californication and True Blood. While she delivers a genuine performance, complete with plenty of screams and cries, there are the odd bits which feel a bit over-egged. In "an Arnie moment" the words "I hate tombs," spill from Croft's lips. Cringe? Kind of. We had a little chuckle though. Otherwise the full cast pulls off a pretty sturdy show, a necessity as it maintains that emotive connection with the characters as the story progresses. The story is one thing, but Tomb Raider just wouldn't be Tomb Raider without the usual array of platform jumping, rock climbing and the like. It makes up a large part of the game and, while well beyond believable - this girl would put Greg Rutherford's long jump to shame - is a lot of fun. You'll need to combine accurate button presses to jump between platforms, drop down strategically and, in some cases, avoid falling debris by manoeuvring or button-bashing on command in that Heavy Rain style. Failure to do so and it'll be rocks through the head, or spike impalement through the chin - there are some cutting death scenes to say the least. Shooting also takes up a large part of the game, particularly as it progresses. What begins as bow and arrow pinging quickly develops into pistol firing, eventually building up to automatic weapons, shotguns, grenades and beyond. Weapons can be upgraded too, but you'll need to find the right amount of salvaged parts to beef them up. It means exploring becomes an essential aspect of the gameplay - it's not all jumping and shooting - in order to develop the character and stand a better chance of surviving against the tougher enemies as they appear in greater numbers. It's possible to auto-target, which makes for fairly easy shooting experiences, but for extra points some stealth killing or well-positioned arrow head shots make all the difference - not only XP, but general player satisfaction too. This introduces the element of stealth which can be an essential, depending on how you want to play the game. Set a man on fire and his screams will attract attention, garotte him with a pickaxe handle and, as grim as it sounds, it's a more-muted way to pick off your foe. Although we won't reveal the human nasties' backgrounds and why they're out baying for blood, it goes without saying that they're downright freaky and have all the appeal of a night out with one of the weirdos from The Hills Have Eyes. Lara reacts responsively and the dual stick play method - we've completed the PS3 version, while the demo version we've played previously was on Xbox 360 - which makes light work of navigating the world while simultaneously positioning the camera. The game also boldly throws up specific scenes with fixed camera angles or wildly adjusted ones - claustrophobic close-ups in water-filled tunnels; wide pan-outs while climbing up rock faces and plenty more. It gives the game a genuine cinematic feel, furthered by shallow-depth-of-field cutscenes. Occasionally these scenes on the PS3 version seemed to drop frame rate a tiny bit, otherwise the game is as slippery-smooth as a greased-up Croft in a plastic paddling pool. Weather and lighting conditions also add stacks of atmosphere - be it the sun breaking through the clouds, the wind dragging a storm in, or a snow-fuelled blizzard - it's all here and it looks glorious. Caverns can be dark and dingy, which is where illumination by flame comes into play - assuming you're not seen because of the light source. The vast world not only offers a linear storyline, which takes place throughout a variety of places, but it also has side missions in other tombs. You'll need to hunt these out to fully complete the game - even after we rolled the final credits we'd only worked through 66 per cent of the game. This element is akin to, say, Skyrim to some degree - you'll want to fast travel to map-marked sections in order to navigate and hunt out clues and hidden entrances. There's plenty of life in searching out the full world. Despite the considerable amount of land to cover - a front-to-back finish of the game is probably around 20 hours - there's little loading time to worry about. A flashing "TR" logo to the bottom right of the screen pops up aplenty, but rarely if ever disrupts play; there's seamless integration between gameplay and cutscenes. Top work. Tomb Raider in 2013 takes the generation of pop-tastic Girl Power and coats it with a thick, treacle-black storyline that's more reminiscent of a Christopher Nolan epic; it elevates it above most action-adventure titles we've ever played. It's edgier and more contemporary than the predecessors that its severed itself from and, importantly, is bags of fun to play. There's cinematic style, an emotive storyline, more than the one dash of controversy as well as the need to think before pulling the trigger depending on how you like to play. The weather-torn landscape is gorgeous and will take plenty of time to explore then explore again in order to complete every non-linear side mission that's tucked away within the game. After immersing ourselves in the game for three intensive days we felt like we'd completed an epic back-to-back movie marathon. Such an intense period of play did make some sections feel a little repetitive in parts, but that's the only minor criticism that we can really lay at Tomb Raider's feet. Move over Uncharted, Lara Croft is coming and we've no doubt that she's got the grit to take Mr Drake by the balls. Tomb Raider is not just as good as Uncharted 3, it's better. We loved every minute of this shiny treasure. So now fly like magpies and pick up this game when it lands on PS3, Xbox 360 and PC from 5 March 2013. You won't regret it one bit.